Take the quickest route to clean paths, patios and driveways. 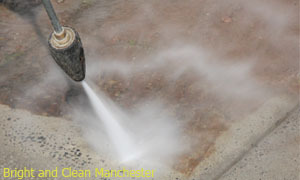 Book jet washing in Manchester to lift grease, grime, algae, moss and even weeds between block paving. Power washing can be used for almost any hard external surface so call us to clean your awnings, fences, garage floors, caravan and even walls. The more items you put together the greater the transformation you’ll see to the outside of your property. You’ll also find that combining all your power-washable items together makes this already economical service even better value for money. Get a free quote 24/7: Do this on the phone, through our chat facility or send us a request by filling in our contact form. Your quote is based on the surface area: The price includes equipment use and labour. 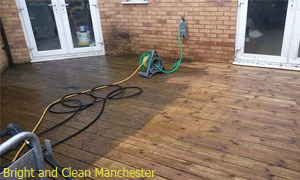 Book your jet washing when it suits you: We have flexible appointments and work seven days a week. Get a more attractive outdoor space: And a safer one too, algae and moss are often slippery underfoot and represent a trip hazard. Gain added value: Combine this work with certain other services: Maybe one off cleaning or gardening services would suit you. Paths, Driveways and Patio: Constructed of concrete, stone, brick, crazy or block paving, tarmac, slabs, or any other firm surface. Garden Furniture: Plastic, wooden or metal. Then there’s garage doors, caravans, awnings…if in doubt, just ask! Your cleaners will start by checking to ensure that the area where the cleaning is to take place has sufficient drainage and that the items or surfaces are suitable for pressure washing. They’ll connect to a suitable water supply, an external tap is preferred but not essential. When you ask us to jet wash paving slabs or bricks we’ll finish the process by filling in cracks with kiln dried sand to prevent weed regrowth. Once the cleaning is complete you’ll be asked to check the results and confirm that you’re happy with the work. Our team members are reference and ID vetted before commencing employment. The technicians who complete your pressure cleaning are trained and certified in the use of the equipment we supply. This training includes the assessment skills required to ensure that only items suitable for pressure washing are treated with the technique. Very occasionally we’re asked to clean items which won’t withstand the power of the water jets. If this happens our cleaners will explain the situation and suggest an alternative cleaning method. Your service is covered by full insurance and subject to our ongoing quality control evaluation.